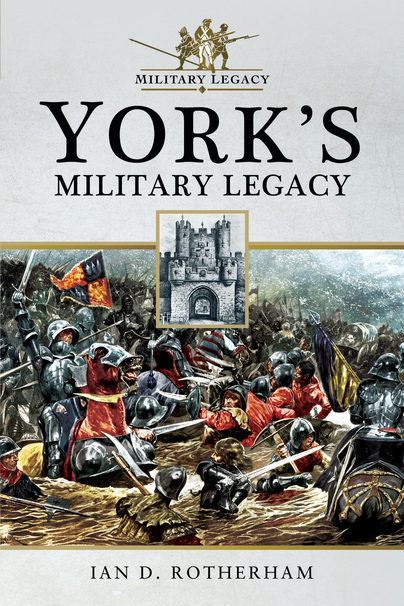 You'll be £14.99 closer to your next £10.00 credit when you purchase York's Military Legacy. What's this? One of the oldest settlements in Western Europe, York grew up on dry land with protective rivers and associated wetlands giving security and mobility. Early, prehistoric settlement was on nearby drier, raised areas along the floodplain. Here the Romans built a great, northern, fortified city and military settlement from which they could foray overland into northern England or by ship and the coastal route to Scotland and the Picts. York’s significance was emphasized when Constantine was made Emperor whilst residing there. Lean times followed after Roman abandonment and Saxon neglect before the Vikings swept into northern England, with Jorvic, re-born as their capital, York, much to their liking. Once subsumed into Anglo-Saxon Northumbria, York continued its huge strategic and military significance through late Saxon times, during the Norman Conquest, and into medieval England. Indeed, two of the most far-reaching battles in English history were fought at nearby Fulford and Stamford Bridge. York’s military significance grew again during the Wars of the Roses, with the Battle of Towton in 1461 described as the most barbaric ever fought on British soil. Following oscillating and vicious disputes over religion during the reigns of the later Tudors, divisive and punitive civil war played out again under the Stuart kings and Parliamentary Commonwealth. Through all this, York was a major strategic location in northern England; an important base for those commanding it, a significant prize for those who did not. This military importance declined into modern times but the city retains garrison and regimental ties. The last direct conflict occurred when York was targeted for retaliatory Baedeker raids by German bombers during April 1942. York’s remarkable history and longevity, and its significance in English and sometimes international politics and economics, have left a unique, unparalleled military history.